“Keeping attuned to present and future market trends, while being aware of our customer’s specific market needs, drives Datalogic’s innovative approach to product design,” comments Francesco Montanari, VP and GM of the Mobile Computer Business Unit. 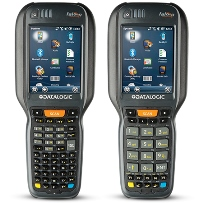 Datalogic S.p.A., a global leader in Automatic Data Capture and Industrial Automation markets, today announced the availability of the Falcon™X3+ mobile computer, representing the next evolution of the very successful Falcon X3 mobile computer. The Falcon X3+ device provides the ultimate performance in ruggedness: a Corning® Gorilla® Glass 3 scan window, IP65 sealing rating, rubberized polycarbonate enclosure and a concrete drop spec of 1.8m / 6.0ft along with sequential testing of 1,500 random falls from 1m/3.3ft, all combine to offer investment protection for the long term. The Falcon X3+ mobile computer retains the same form factor and is able to use the full set of accessories of its predecessor, while a new rubber boot accessory assures further overall protection when the product is used in the harshest conditions. Wavelink® Avalanche® for sophisticated device management, and Wavelink® Terminal Emulation for legacy support, are both pre-installed and pre-licensed on every Falcon X3+ device. Together with the new Extra Long Range 2D imager (2D XLR) to get the extra distance up to 9.5m / 31.3ft and capable of reading in full sunlight, the High Performance Laser (HPL), the Extra Long Range Laser (1D XLR) and the 2D Standard Range Area Imager (2D SR) all achieve an improved depth of field of more than 20 percent over its predecessor. Datalogic’s patented ‘Green Spot’ technology for good read feedback is available in both the HPL and 2D SR models. Secure and seamless roaming is enabled through wireless communications over a Laird/Summit 802.11 a/b/g/n radio with CCX v4 certification. A powerful parallel computer architecture combines with additional flash storage for local database and asynchronous applications. Wired communications are available through a complete set of standards such as USB Hi-Speed 2.0, RS-232, Modem and Ethernet. A choice of Microsoft® Windows® operating systems includes Windows Embedded Handheld 6.5 (WEHH) and Windows CE 6.0 Professional (WinCE). The Falcon X3+ mobile computer is equipped with a full shift battery and a choice of either a VGA (WEHH) or QVGA (WinCE) bright 3.5” touchscreen display. A 3.1 Megapixel color camera is included on all the WEHH configurations for capturing images such as product placement or damaged goods. Operator comfort is assured through the contoured shape with an arched handle, ergonomic trigger, 10 percent lighter weight than competitive devices, transflective screen for daylight visibility and user-friendly backlit keyboard layouts. Datalogic’s attention to detail really makes the difference in the Falcon X3+ mobile computer, making data collection faster, easier and more efficient. Datalogic Group is a global leader in Automatic Data Capture and Industrial Automation markets. As a world-class producer of bar code readers, mobile computers, sensors, vision systems and laser marking systems, Datalogic offers innovative solutions for a full range of applications in the retail, transportation & logistics, manufacturing and healthcare industries. With products used in over a third of world’s supermarkets and points of sale, airports, shipping and postal services, Datalogic is in a unique position to deliver solutions that can make life easier and more efficient for people. Datalogic S.p.A., listed on the STAR segment of the Italian Stock Exchange since 2001 as DAL.MI, is headquartered in Lippo di Calderara di Reno (Bologna). Datalogic Group as of today employs about 2,400 members of staff worldwide distributed in 30 countries. In 2013 Datalogic Group achieved revenues for 450,7 million Euro and invested over 35 million Euro in Research and Development with a portfolio of over 1,000 patents across the world. Datalogic and the Datalogic logo are registered trademarks of Datalogic S.p.A. in many countries, including the U.S.A. and the E.U. Falcon and the Falcon logo are registered trademarks of Datalogic ADC Inc. in many countries, including the U.S.A. and the E.U. Wavelink is a registered trademark of Wavelink Corporation. All other brand and product names are trademarks of their respective owners.